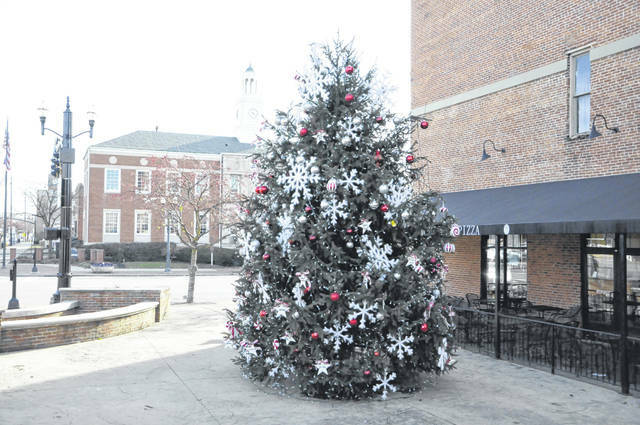 The Christmas tree at the southwest corner of West William and South Sandusky streets in downtown Delaware will be lit during a ceremony scheduled to take place at 6:30 p.m. on Friday, Nov. 30. With the Thanksgiving holiday having come and gone, the Christmas season has officially descended on Delaware. Main Street Delaware will kick off the season with its second annual “Home for the Holidays” weekend, a three-day event that will begin on Friday, Nov. 30, and run through the weekend. The festivities will begin on Friday with the lighting of the downtown Christmas tree at 6:30 p.m. The tree is located at the southwest corner of the Sandusky and William streets, in front of Amato’s Woodfired Pizza. Carolers, horse-drawn wagon rides, reindeer, and the arrival of Santa Claus will add to the festive feel downtown. Santa Claus will be hosted at The Strand from 6-8 p.m. beginning that Friday and from 1-3 p.m. on Saturday. He will be available at The Strand each Friday and Saturday leading up to Christmas Day at those same times. To ensure everyone can get downtown for the tree lighting, and to assist with Delaware’s notorious parking woes, DataBus will be providing a free shuttle service between downtown and Mingo Park. The shuttle will begin service at 5:30 p.m. and will run every 15 minutes up until 9:30 p.m.
On Saturday, the celebration will continue with a downtown shopping extravaganza until 6 p.m. that will include a “Dash for Dasher” scavenger hunt from 11 a.m. to 1 p.m. Beginning with the first clue at the Main Street Delaware office, located at 20 E. Winter St., families will follow clues to help Santa find his missing reindeer. While there is no cost to participate in the scavenger hunt, boxes of cereal and monetary donations will be accepted to benefit Delaware County’s People in Need food pantry, which has been serving the county for more than 35 years. Afterward, Kathy Brady of For His Glory Photography will provide professional photography with Santa at The Strand, offering 4-by-6 prints for $5. Main Street’s annual Christmas parade will cap off the weekend on Sunday, led by Susie Stromberg, owner of Toujours Unique Resale Boutique on North Sandusky Street and longtime parade organizer, who will serve as the grand marshal. The parade will kick off from Mingo Park at 3 p.m. and will travel south through downtown to Wilmer Street. Children should have their Christmas lists ready to go as the U.S. Post Office will be collecting letters at the beginning of the route to send to the North Pole. Registration to participate in the parade has been extended through Nov. 26. To participate in the event will cost $25, and anyone interested can visit www.mainstreetdelaware.com/parade.html. The following weekend, Main Street will host its December First Friday event, a holiday recipe tour through the downtown businesses, from 6-9 p.m. Patrons can pick up their recipe card at any participating locations and then make their way through the remaining businesses to fill out their recipe book. For more information on Main Street Delaware’s upcoming events, contact 740-362-6050 or email director@mainstreetdelaware.com.